Task:Our task was to answer the questions in the presentation. In the presentation it talks about the Auckland flooding crisis and how the city was affected. First we answered all the questions in the slides then on the last slide it said to make a poster or film about the problem. 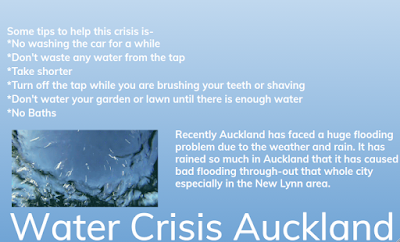 Here I have done a poster about the water crisis and how we can help. I really like your poster about the water crisis in Auckland. It noted some very important ways we can help save water. What are some ways you will start helping to save water?